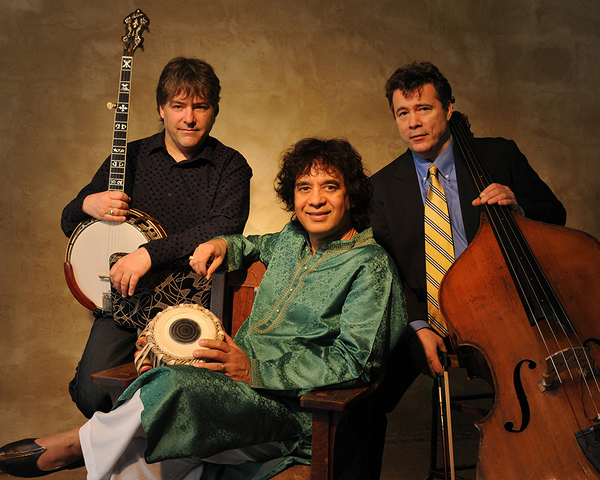 Photo by Jim McGuire Béla Fleck (left), Zakir Hussain, and Edgar Meyer perform together November 14 at Eisenhower Auditorium. Three masterful instrumentalists and the leading virtuosos on their respective instruments, Béla Fleck, Zakir Hussain, and Edgar Meyer move with ease among the spheres of classical, bluegrass, jazz, and world music. The musicians come together November 14 at Penn State to perform original compositions showcasing the beauty and versatility of the banjo, tabla, and double bass. Special guest Rakesh Chaurasia, an important Indian flutist, will join them in concert at Eisenhower Auditorium. Five dollars of each ticket sold will be donated to Penn State THON. Each of the seven previous times Fleck has visited Eisenhower, including a 2004 duet concert with Meyer, the banjoist has performed with different musicians. Fleck has reinvented the image and sound of the banjo in a performing and recording career that has taken him to a plethora of places on the musical map. He’s won a shelf full of Grammy Awards and been nominated in more categories than any other artist. Hussain, who appeared at Eisenhower in 2007 as part of the Global Drum Project, has become a national treasure in his home country, India, through brilliant and exciting performances as a classical tabla player of the first order. One of the chief architects of the contemporary world music movement, Hussain has earned international fame on his own and through collaborations. A New Yorker writer calls Meyer “the most remarkable virtuoso in the relatively unchronicled history of his instrument.” The double bassist’s technique and musicianship, in combination with his gift for composing, have brought him widespread appreciation by classical and folk music audiences. Meyer has recorded duo projects with Chris Thile and Fleck; as a quartet with Joshua Bell, Sam Bush, and Mike Marshall; as a trio with Fleck and Marshall; and as a Grammy-winning trio with Yo-Yo Ma and Mark O’Connor. Chaurasia, a former child prodigy, is known across the globe for his classical and non-classical concerts. He’s also an acclaimed studio musician who has recorded with many of the leading names in the Indian film industry. Chaurasia, who plays the bansuri (a side-blown bamboo flute common to southern Asia), has toured with Hussain. He’s also performed with Fleck, Meyer, and Joshua Redman. His most recent venture is a fusion band, Rakesh and Friends, which creates music intended to appeal to young audiences while staying true to the essence of Indian classical music. Don and Mary Ellen Fisher sponsor the presentation. For tickets or information, go to cpa.psu.edu or phone (814) 863-0255.